Alex Jones banned from iTunes and Facebook | America loves Sporks! Feeling the hubris of reaching $1 trillion in market capitalization, Apple has pulled down 5 of six of Infowars / Alex podcast libraries in order to protect people with differing opinions. In a related story, our friend Candace Owens decided to take the venomous anti-white, anti-male, anti-heterosexual hate tweets of Sarah Jeong, the new member of the editorial board of the New York Times – and posted them verbatim except replacing the word “white” with “Jewish”. That quickly earned her a 12 hour posting ban. Since the original Sarah Jeong tweets were never pulled down, it nicely proved the point that Twitter hates hate speech, except when directed at white people, Christians, heterosexuals, and other reprobates. In response to reaction to their action, Twitter backed down – this time. Perhaps because they don’t know that President Trump gets his daily intelligence briefings from Alex Jones, or perhaps because they do know – expect the President to single out Facebook for unpleasantness. I still cannot believe someone would march around with a sign which so clearly identifies them as self-loathing narcissists, while screaming at Tea Party Patriots. When I was working at the CBOT in 1992, a rogue trader named Darrel Zimmerman nearly destroyed the exchange. He has a pattern of doing unauthorized trades that could make him a personal fortune if they were successful but lost and someone else had suffered the financial consequences. Timing in life is everything and so is size. Many large firms did something similar got caught in 2008 – no one went to prison. Instead, they got a reward from the taxpayers with zero percent interests – it was called “QE”. Excellent points Chairman. I guess all of the ‘normal’s and ‘ALex’ had to get in bed with Youtube, iTunes , and ‘Gooberbook’ ( F) to make sure the defense of Liberty made it out to all of us minions. I can not believe people thought these leftest companies would allow ‘Free speech’. Gooberbook-Zuckerburg, and Google would not allow this once they caught on they were being used. Old TV -newspaper media, hell no one cares what they say. Seems like people should have seen it coming. Youtube is not liberty, they are pop culture & Trash. dial it down cause I don’t need them ruining my health and don’t want to be labeled as a ‘hater’ or ‘bitter’. Ha Ha Anyhoo , I thought we were going to have a SRG reunion at the K&W in Statesville NC ? I’ve got an old friend in the DC area that keeps reminding us that we are overdue for a visit… that is probably the halfway point. We could set up something on https://www.meetup.com/ if anyone is interested. I think last time Fred said he would pass, but I am always game for opportunities to talk radio and streaming and having a bite to eat. Noam Chomsky is a fascinating guy. When I read him a few decades ago, he came across as more of a communist than a liberal, but he is still right on many points and criticisms. One that has really stuck with me and become somewhat mainstream is the notion that sending in bags of food to feed people suffering from a man-made (corruption driven) famine does more long-term harm than long-term good – it puts the few remaining farmers out of business because they can not compete with “free”. They can not pay their seed and fertilizer loans and will not even attempt to grow food the following year – it is easier for them to stand in the food line. He planted the thought that perhaps there were two real unstated reasons for sending free food overseas – prop up the US farm industry without lowing food prices here, and longer-term harm to the countries that are trying to get out from under corrupt governments – US imperialism. You may not agree with much of what he has written but he is a very thoughtful writer and will make you think in ways that CNN / MSNBC / FNC will not. And he invented the Perl programming language. Twitter has joined the movement to pretend Alex Jones doesn’t exist. They suspended his personal account for seven days for urging action to combat censorship. Did Jones mention the Falun Gong or something? We must protect diversity of opinions. The Austin Statesman is announcing that the FCC is fining the owner of an unlicensed FM Pirate station in Austin (TX) $15,000 for unlicensed operations. They describe it as the Alex Jones flagship station. Alex Jones is syndicated by GCN, which allows pretty much anyone to broadcast programming. No money is involved – just basically let the network ads play. They do offer market exclusivity, but that is not likely a problem. 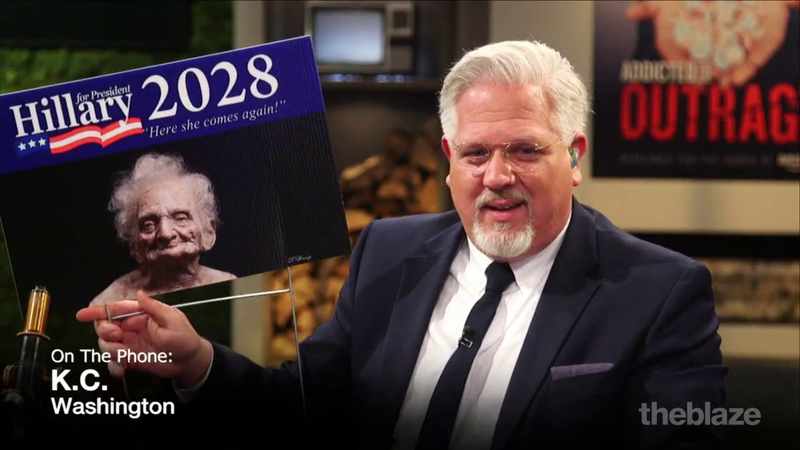 Chris Plante is pretty funny, but Glenn Beck has his moments. Today he introduced his yard signs for the 2028 Presidential campaign. Enjoy.